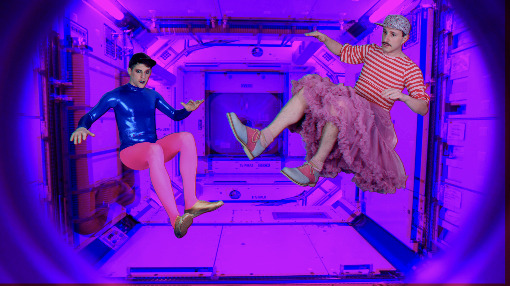 Description: Join us for the Omaha premiere of Out There, a concept video album and live performance by art-pop psychedelic duo Princess (Alexis Gideon and Michael O’Neill) that explores the role men ought to be playing during the current cultural reckoning of misogyny. Out There’s science fiction narrative piece references the original power of MTV and builds on the long legacy of albums like Deltron 3030. The video explores the power of the Divine Feminine through collaborations with JD Samson, visual artist Jennifer Meridian, and the band TEEN. Gideon and O’Neill perform the music alongside the projection of the video. According to the artists, the performance is Beyoncé's "Lemonade" meets "Hamilton" meets Kraftwerk. Princess uses music as the backbone of a multi-disciplinary practice that often explores issues of queerness and the concept of masculinity. Simultaneously gay, straight, queer, masculine, and feminine, Princess embodies the fluidity and coherence between the seemingly contradictory. The world premiere of Out There took place at the Andy Warhol Museum on March 1, 2019 followed by a tour including the NYC premiere at New Museum, MCA San Diego, Bass Museum of Art, MOCA Cleveland, MIT List Visual Arts Center, Wexner Center for the Arts, DePaul Art Museum, Bemis Center for Contemporary Arts, Alabama Contemporary Art Center, Rochester Contemporary Art Center, Sarasota Museum of Art, Contemporary Art Museum Raleigh, and others.